Scarlet Macaws (Ara macao) are threatened by unsustainable harvesting for the wild bird trade, hunting and habitat loss. Progress and outcomes: From the mid-1990s WPT has supported direct conservation, education programmes, captive breeding and release, and rehabilitation and release of birds caught in the trade, with in-country partners in Mexico, Belize, Honduras and Costa Rica. With the Macaw Recovery Network in Costa Rica WPT has been supporting the confiscation of Scarlet Macaws from the wildlife trade, rescuing and rehabilitating confiscated birds, encouraging captive reproduction of the species, and releasing birds to the wild to supplement wild populations. In 2016 at Punta Islita the birds began to utilize nest boxes constructed by the team. Over a dozen juvenile macaws have been released. In 2018 during the breeding season in Honduras, Scarlet Macaws released at Copán Ruinas produced seven chicks, with four chicks hatching at partner facility Macaw Mountain Bird Park. Elsewhere in Honduras,12 macaws were released at the Finca Santa Isabel outside of Copán Ruinas; the first into a 870 square kilometre protected zone designated "The Sacred Valley of the Scarlet Macaw." A second group of 10 macaws was freed on a private island near Roatan to add to a current population residing there, and are now breeding. In Mexico, a multi-year project to restore macaws to Los Tuxtlas Reserve with birds from Xcaret Eco-Archeological Park's breeding centre has seen over 160 Scarlet Macaws released there. Focus of future work: WPT will continue to provide support for local groups fighting to save the Scarlet Macaw from the wildlife trade, and for in-country captive breeding and release programmes to restore the species to areas where it is locally extinct. With your help we can continue to support actions to conserve Scarlet Macaws. Wild population: 20,000 – 50,000; total C American population no more than 4000. Where found: A. m. macao: Costa Rica on Pacific slope; S Panama, on Azuero Peninsula and Isla Coiba, then scattered through N South America, east of Andes, from Rio Magdalena valley, Colombia to Guianas and south to E Ecuador, E Peru, E Bolivia and N Mato Grosso, Brazil. 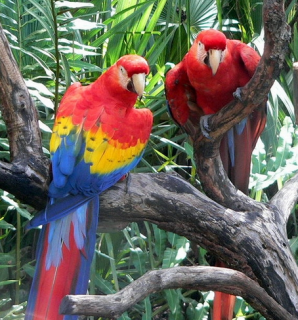 History: The Scarlet Macaw (Ara macao) is found in Mexico, Honduras, Costa Rica, Colombia and Venezuela. Although the Scarlet Macaw is listed by IUCN as Least Concern there is evidence of a population decline in the wild. It is listed by CITES as Appendix I. The declines in this species' population are due to habitat loss and fragmentation (expected to lose 20-35% of habitat within its range over 40 years (Soares-Filho et al. 2006, Bird et al. 2011)), the wild bird trade and hunting for feathers and food. Ecology: The Scarlet Macaw is found in lowland rainforest and savanna, in Mexico remote portions of humid forest, on the Pacific slope in Honduras, in Costa Rica deciduous and humid forest, Colombia in lowland rainforest and gallery forest and Venezuela in rainforest and savanna. Birds are encountered in pairs, parties of 3-4 or flocks up to 30 individuals as they forage on fruits, fruits and nuts of various palms, and seeds, flowers and nectar.